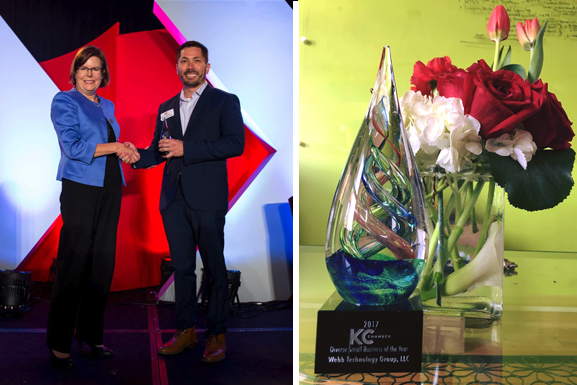 KANSAS CITY, MISSOURI (June 12, 2017) - Webb Technology Group, LLC., a Kansas City-based minority and veteran-owned mobile technology firm specializing in nimble and responsive technology for minority and women-owned businesses has been named the 2017 Diverse Small Business of the Year by the Kansas City Chamber of Commerce during the annual Small Business Celebration. The Diverse Small Business Award is geared towards small businesses that are minority-owned, veteran-owned, service disabled veteran-owned, or LGBT-owned that have demonstrated vision, leadership, and courage by achieving business success while overcoming obstacles and maintaining a strong sense of service for the community. The Small Business Celebration is recognized as one of the largest Chamber small business celebrations in the United States with a series of events throughout the year that supports and celebrates the small business community within the Kansas City region.